Hope You want to Download your Bank Admit card . Now your are in Right place. Here You can be easily Download Bangladesh Bank Online Admit Card. Just Insert Your information on there official website log in page. There are not Additional Admit Card will be issued for Written Test. MCQ Admit Card will be considered as Written Admit Card. For Get There Official BB Admit Card Download link Use below this Url in your Browser address bar . 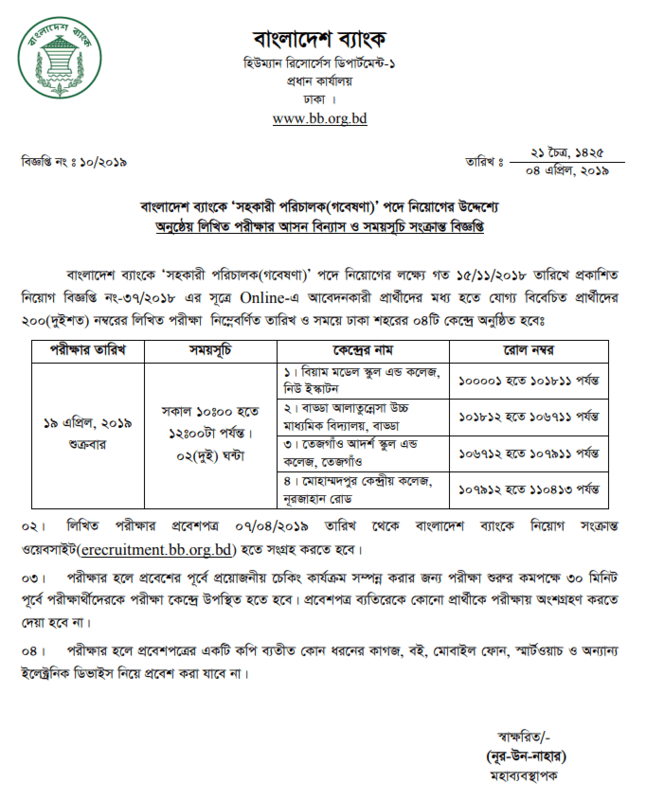 Date of Written Exam for the post of Assistant Director (Research) of Bangladesh Bank to be held on 19 April, 2019 (Time : 10:00am-12:00 pm). Examine 200 mark MCQ question answer with in 2 hours. Exam center are given below. If you forget your User or Password Call there help line from any Mobile. Or Send email to [email protected] . For more updates about All Bank Admit Card Download Link Keep visit this website. Thanks for Stay with us. This entry was posted in Bank Career, Notice and tagged Bangladesh Bank Admit Card Download, bank jobs, erecruitment.bb.org.bd/onlineapp/print_admit.php by ejobscircular. Bookmark the permalink.